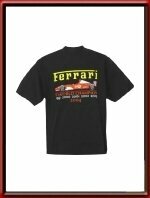 Ferrari Six Times World Champions T-Shirt, Black - LIMITED EDITION. Yes! A relic from times gone by! Come and celebrate Ferrari's 2004 (!) 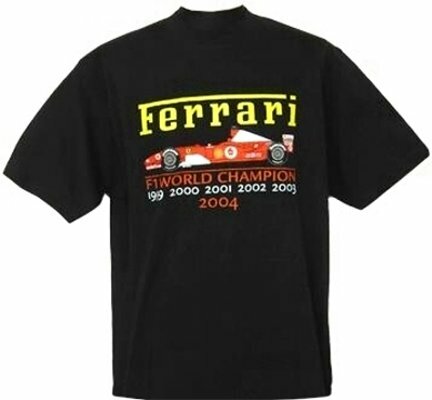 F1 Constructor's Title with this great black tee shirt. Carries a large Ferrari script logo print, elaborate print of Michael Schumacher's Ferrari F2004 F1 car and lists the 6 years of Ferrari's consecutive F1 Constructor's titles (1999 - 2004). ONLY available in size M and that is the very last one! FREE packing, handling & shipping to ANY destination in the world !! This is of course official Ferrari Merchandise.